Following a calorie restriction diet can be a happy and healthful experience. But before you begin calorie restriction, you need to know what that really means. Lots of people think that eating as few calories as possible – a starvation diet – is what calorie restriction is about. Nothing could be further from the truth. You can eat a lot of food on a calorie restricted diet – and the calories don’t have to be excessively low. 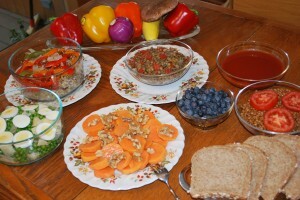 Take a look at this picture of calorie restriction recipes, created by LivingTheCRWay.com. If you ate healthy portions from every recipe pictured here, you would still be at only 700 calories for a meal. So what makes a calorie restriction diet different? Calorie Restriction is about changing the way your cells communicate so that longevity genes are activated. You can find out more in this blog: What is Calorie Restriction, Anyway? Recipes for a calorie restriction diet are provided in the CR Way for Longer Life Software, which is included as a benefit to members of LivingTheCRWay. com.